I’ve been using ioBridge & X10 for a couple years now to control some of my appliances / lights etc. in my apartment. ioBridge is a small module that allows you to web-enable your projects. Once you buy the control panel you can extend it with various boards, probes and sensors. 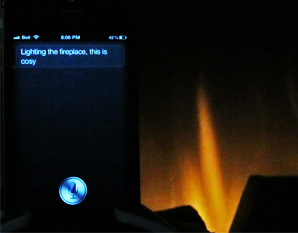 With the release of SiriProxy you can now intercept Siri commands and create your own custom commands and responses. Using this I setup a simple SiriProxy plugin to call a PHP file on my web server, which in turns triggers the ioBridge to send the X10 command to the desired device. Watch @paulacroken play with our new voice activated system. The first step is to get SiriProxy running successfully and the ioBridge module setup with X10. Next you can create individual PHP files for each action and upload them to a folder on your website. Finally create a custom Siri voice command to open the URL of the PHP file you uploaded – this automatically triggers the X10 action and turns the device on or off. I used this PHP script as the base for each of my actions. I hardcoded the widget ID and state variables (1 for on, 0 for off) in this script – so every time you load the PHP file it triggers an on or off action automatically. say "Turning on your living room lamp"
say "Turning on your christmas lights"
Good luck if you decide to try this, SiriProxy opens up a ton of interesting DIY ideas!